It’s me who can’t stop. I read everything Chimamanda Ngozi Adichie writes. I only started reading her by accident, when I was facilitating the Kuwait Book Club I never intended to belong to, and found myself reading so many books by authors I had never heard of. We were reading Half Of a Yellow Sun and all of a sudden, I WAS Nigerian. She can do that. She uses the senses, she uses the thoughts in our head. We are really not so alien, us and the Nigerians I start to think. I have Nigerian friends, from the church. We all get along. We have a good time together. Hmmm. OK. That makes sense. I mean, I thought I was Nigerian because in Half of a Yellow Sun, I was Igbo, living in an academic community in Nigeria, and hmmmm. You’re right, Chimamanda, there were no white people around. Just us Nigerians. Chimamanda, with her sharp, all-seeing eyes, her sharp ears and her sharp tongue make me cringe as she comes to the USA and comes up against assumptions many have about Africa. Do you even know where, exactly, Nigeria is? Do you know where Ghana is? Most Americans can find Egypt on a map of Africa, and MAYBE South Africa, but the rest is . . . mostly guesswork. Because we send clothing and food aid to African countries, we have the idea that all Africans are poor, but that is not so, and is insulting to the middle-class and upper class Africans who travel elsewhere for leisure – and education. I don’t know how much of Chimamanda Ngozi Adichie’s book is autobiographical and how much is fiction. I know that her observations are acute, she nails expat friendships, she spotlights our blind spots and hypocricies, and she holds you in her grip because she is no less harsh with herself – if, indeed, her Ifemelu, the main character in Americanah, is reflecting Chimamanda’s own experience. The experiences, coming here, the overwhelming differences in manners and customs, even volume of voice and width of hand expression, are so immediate, so compelling, so well described that they have to have been experiences she herself had, and had the eyes to see. She must have taken notes, because she totally nails the expat experience. 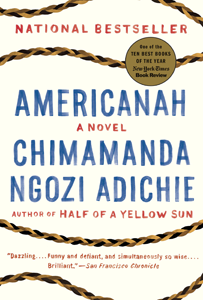 Book ads and book reviews focus on Americanah as a book about being black in America, and it truly is that – as seen from the eyes of a non-American black, as she often reminds us. She is hard on herself, returning to Nigeria, and quick to note that much of the change is in herself and her changed perspective. While I love the romantic storyline, I was disappointed by the fantasy ending, given how self-disciplined Adichie is at keeping it real in every other facet of the novel. On the other hand, I am still trying to think of an ending that would work for me, and I can’t. While her ending wraps it all up neatly, it’s the one part of the book where her sharpness dulls. One of the things I liked best about the book was going behind the scenes, being Nigerian, going to school, having coffee, working, going to parties with other Nigerians, chatting with my girlfriends. We’ve done things with nationals of different countries before, but you know as soon as you walk in that your presence changes things. Chimamanda Ngozi Adichie takes me with her and no one knows I am there, observing, learning, figuring out how things are done when it’s “just us” Nigerians. Here’s why I am a Chimamanda Ngozi Adichie addict. She keeps it real. She has eyes that see, and ears that hear, and a gift for capturing what she sees and hears and a gift for writing it down. She has insight, into herself, into others, into character and motivations. She is sophisticated and unpretentious, she admires and she mocks, but when she mocks, it is as likely to be self-mockery as mockery of another person, class, ethnicity or nation. Reading Adichie, I understand our similarities – and our differences. I believe she would be a prickly friend to have, but I would chose her as a friend. This is one terrific book. 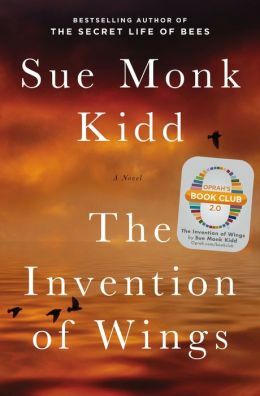 Amazon recommended this book to me, and as a person who loves just about everything Sue Monk Kidd writes, I bought it immediately. AdventureMan had also read a review and said it might be a good book for our book club, so he gets it next. Most of my friends have it on Kindle to read soon. The book is written in two voices, that of Sarah Gremke’, white, and Charlestonian, of Charleston society families, and the other voice of Hetty/Handful, the slave given to Sarah for her 11th birthday. First Sarah tries to refuse the ‘gift,’ then, using her father’s law books, she writes a letter of emancipation for Hetty, and neither effort works. Sarah and Hetty are stuck with each other, stuck with the times, stuck with their situation, and stuck with the institutions that determine and limit what they will accomplish. There were times, as I read the book, that I felt like I was going to suffocate. First, the heat and humidity of Charleston, South Carolina, are bad enough without the kinds of close-fitting clothing women were required to wear in that day; the thought of wearing those clothes makes me choke. The limited expectations for women would stunt and damage the strongest female character in that society where those who thrived were those who were pretty, good at getting married, and good at bearing children, dressing appropriately and socializing endlessly at the same stale events. Slavery damages everyone. No one should have that kind of power over another human being; studies show that when human beings are given power over another their very worst instincts come to the forefront. Why do we need studies? We have the real world to show us what that kind of power does, how it corrupts the one who holds the power so thoroughly that they don’t even know they are corrupted. My maid had worked for a family where the men pestered her because she was full time and live-in. They assumed she was sexually available to them and made life very difficult for her. Her mistress saw a beautiful silk blouse she wore, a blouse she had saved for and only wore on her day off, and her mistress borrowed it, stained it, returned it and didn’t take any responsibility for ruining her one really nice blouse. It was never mentioned again. Only when the men complained about this woman was she allowed to leave; her mistress didn’t want the men tempted, she got her passport back and come to work for me. Her previous mistress wanted an ugly maid, and the men were hoping for someone more compliant. The woman who bought my car had saved and saved, and was working under deplorable conditions in a day care. I told her that she had skills, get another job, and she told me that she hadn’t been paid for three months, and if she left she would never get that pay, and also her employer would never give her her passport or allow her to leave. She was, in effect, a slave. Most of my friends are very good employers, taking good care of the people who come to work for them, but I have seen those (not my friends) who are violent and abusive. Being a slave is being trapped in an existence with no control over your own life. Monk makes an interesting comparison of white women’s lives with their limitations being not unlike a variant of slavery. Maybe the conditions were a little better, but the un-free-ness was similar. Sarah Grimke’ and her sister Angelina, against all odds, break free of family expectations and societal constraints. They forge their own way, with Angelina’s gift for rhetoric and Sarah’s keep legal writing. I had never heard of these women before, and I am so glad Sue Monk Kidd wrote this book to raise their visibility both as abolitionists and as some of the very first proponents for women’s rights to full equality. As a quilter, I also loved in this book that Handfull’s mother is a quilter, and while she can neither read nor write, she puts down her history in an applique quilt which clearly spells out significant events in her life, and is a tool for passing family history from one generation to another. AdventureMan came into the room where I was reading and handed me this book. “Will you read this?” he asked, and there was a note in his voice that sounded a little aggrieved. “I read this,” he said. “I thought it was pretty good, but when I read the reviews on Amazon, some people called it ‘trivial’,” and I could see he was embarrassed that something he thought was pretty good others believed was of little importance. I might read a little of the reviews when deciding whether to buy a book or not, because I won’t remember it when it comes time to actually read the book or review the book, but I never, NEVER read the reviews as I am reading or before I review a book. And, truthfully, I don’t really care what this reviewer says or that reviewer says. Sometimes I read a New Yorker review of a book and I think “that reviewer has her own filter and can’t see beyond her framework” or “Wow! That reviewer saw some things I’d like to see!” Sometimes I will read a review and then read the book and think that the reviewer really missed the mark, positively or negatively, it could be either way. Reviews are opinions. We all have them. Some you might agree with, some you might not, but don’t let them touch you, or your experience with the book. We are each unique, and see through a unique lens! First, it delighted me that I read this just after I read Babayaga, because I ejnoy Paris, and delight in walking Paris, and in Babayaga and in All the Light There Was, people do a lot of walking in Paris. So much so in All the Light There Was that I ran down to my little map collection for the Paris maps and would track the heroine through Paris. It was fun. 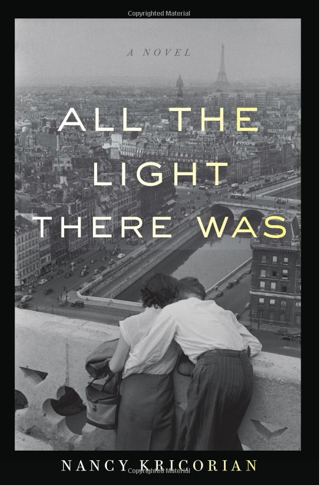 Although All the Light There Was is called a novel, I don’t think it is. As I read it, I thought it was highly biographical or autobiographical, based on a diary or diaries. The significant details – how the mama stockpiled food just as war was announced and all the places she stored it, including under the bed, the clothing they wore, the sweaters they knit, the indignities they endured, and the risks they bravely took against the occupying Germans – it doesn’t sound made up to me, it sounds like a story someone has told from that time. The details are so strong – the bicycle tires that are treasured because if they go flat, that is the end of the last transport they have, the dresses that have become too big because people have eaten too little – these details sound like voices to me. Many in Paris were happy to see the Jews go, happy it wasn’t them. Kricorian tackles this issue indirectly, with a light but inescapable hand. One of the things that was shocking to both of us what that when Maral’s ancient Auntie Shakeh died, and we see the tombstone – she is 35 years old. We knew she and Maral’s parents had escaped the Turkish efforts to eradicate the Armenians in Turkey, but because we are seeing the story through Maral’s eyes, her parents and aunt seem ancient, whereas in today’s terms, they are very young adults. Don’t read the reviews, AdventureMan! Read the book, take from the book what you will, enjoy your own experience. Write your own reviews! 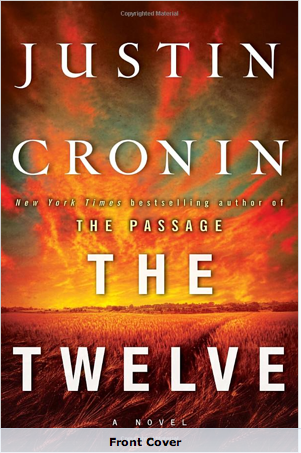 I had downloaded The Twelve to my iPad for a trip, but didn’t get to it, and sort of forgot it was there until my son mentioned he was listening to it on audio-books, and it was good, maybe even better than the first book in the trilogy, The Passage. 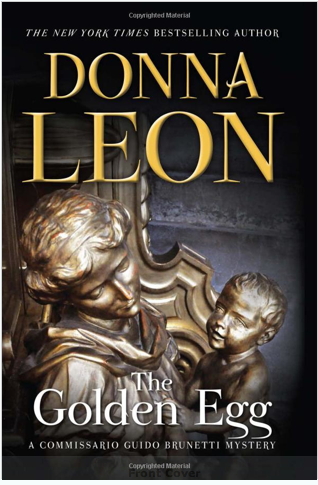 He had loaned me The Passage several years ago when it came out, and as soon as I finished, I got on the list to download as soon as the next book came out – it was that good. Cronin’s gift is an ability to create a future world entirely different from our own, with a devastating enemy – the virals – who, literally, are us, transformed. Cronin can make the enemy terrifying, destructive, truly horrifying – and can make them also captive to their repugnant nature and even pitiable. I think that is an amazing dance for an author to accomplish. The setting is post-apocalyptic USA; the government had a sector working on a secret weapon which – of course – was not able to be contained, creating 12 super vampire-like creatures called Virals, who in turn create hordes of minions. This volume, The Twelve, is set more than 100 years later, but shifts back to earlier times to help us understand how this disaster occurred, and how characters relate back to the earliest times of the disaster. The populations live in fear of sudden attacks; one family, out on a picnic, are almost totally wiped out by an eclipse for which the Virals were prepared – and the families were not. As I read his books, I find them very cinematic, but, as my son and I discussed, too complex for a movie; it would need a gritty HBO series like The Wire, or OZ, or Deadwood to capture the subtleties, the nuances that make this a best-selling series. The heroes and heroines are all make for the screen, their relationships – and inter-relationships – make them interesting, and then, as we learn more, interesting again. We never know enough to make a final judgement on any character; the characters are complex and the relationships obscure until the author chooses to reveal. It makes it fun to try to spot them before he tells us. I missed a couple! Although it can be read as a great-adventure stand-alone, you’ll be happier if you read The Passage before you read The Twelve. If you have a problem with postponing gratification, you might want to wait until the third and conclusive volume of the trilogy is published – and that may be a year or so. The first time I read anything by Jeannette Walls, I had not read her autobiographical best-seller, The Glass Castle. If I had, when I read the opening pages of one of my all-time-favorite books, Half Broke Horses , three young children out checking on the cows in America of the mid-1800’s, I would have said “Oh, yes, this is Jeannette Walls” instead of being so shocked that these three children were so far from home with a storm approaching. Not only does the storm approach – the oldest sister pushes her younger sister and brother up a tree and they are stuck there through a violent storm all night. No adult comes looking for them. I was on the send-as-soon-as-it’s-published list for Silver Star. 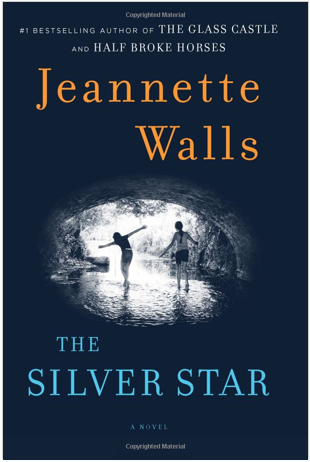 And even once it arrived, I waited until I knew I might have a few free hours in the evening to read it – once you start Jeannette Walls, you can’t put it down. Her heroines in this novel are 15 year old Liz and 12 year old Bean (Jean) whose mother ran away from her hometown in Virginia to pursue a career in music. The mother has a small inheritance to sustain them; when life sours, as it often does for her, she packs the girls into her worn Dodge Dart and takes off. She isn’t always good about paying her bills. She talks to her girls about what a great team they are, and then takes off for a day or two, usually with some man, leaving them to eat chicken pot pies. Then, she abandons them with no sign of when she will be back. The girls are pistols. They are survivors, much like Jeannette Walls grandmother in Half Broke Horses. When social services start coming around asking where their mother is, they take off headed for their Mom’s old home town, across the continent, in Virginia. The heart of the story finds the girls living in the old family mansion, scouting for odd jobs, learning more about themselves and their heritage, and learning how a small community can smother, judge and support their community members in unexpected ways. If you are a negligent, man-oriented, self-absorbed mother, you don’t want to have a writer for a daughter. Jeannette Walls is having a ball; her books are both sad and hilarious, and she has utter scorn for mothers who do not take the reins of motherhood and behave like grown-ups. I didn’t expect to like this book as much as I did; from the first chapter I was hooked, so hooked I didn’t want to go to water aerobics of go to sleep until I had finished it. 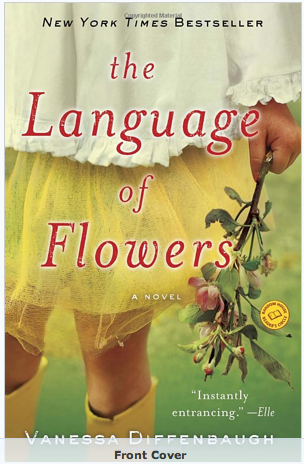 The title sounds girly and romantic, big yawn, but the book is anything but. The book is tough, and edgy, and tackles the foster care system without using sexual assault or out-of-the-ordinarily-cruel foster parents to bludgeon the point. She botches her one great chance at happiness when she sabotages her adoption by Elizabeth, who loves her dearly. The system can even be caring, but the effect of warehousing unwanted and neglected children damages their ability to trust, and to form relationships. We watch her as a child, self-destructive, angry, undermining her own chances of happiness. Victoria even has a girly name to go with the title, but she is tough, and self-reliant, and very, very vulnerable, in spite of her toughness. Aging out of the system, she emerges a waif, with a hunger that stems more from emotional needs than physical. She is greatly blessed to cross paths with people who look at her and truly see her, see her possibilities and her vulnerabilities, people who are willing to work with her, even to love her patiently, in spite of her prickliness and tendency to push people away. One of these is a florist, Renate, who recognizes in Victoria a gift for floral arrangement and is willing to work around her eccentricities. She gives Victoria a part-time job, in which Victoria flourishes. In her emotional life, however, Victoria still has a lot of unresolved issues, stemming back to the very beginning when she was given up by a mother who, for whatever reason, didn’t want her. While she is hungry for love, she fears it as much as she wants it. Relationships overwhelm her. She abandons the love of her life, and then has to live with the consequences. Watching her resolve her issues is cliff-hanging. You can’t stop reading. It’s not like watching a train-wreck; you know this girl has inner resources she has not yet tapped; you can read it in the loving evaluation of those who surround her. Every page of the way you are rooting for her to succeed. I danced when I saw the Amazon box; rarely do I buy hardcover (hurts too much when they fall over if I fall asleep reading, too bulky to carry on planes) but this one I was on the waiting list for, mail it as soon as it is published! 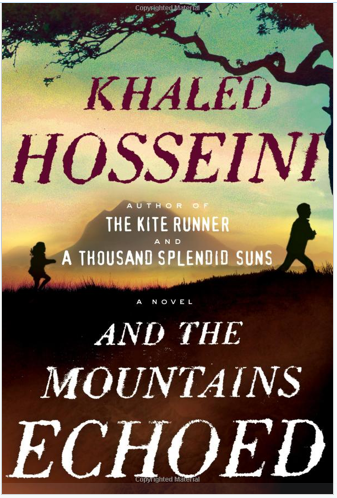 Khaled Housseini, author of Kite Runner and A Thousand Splendid Suns has a new runaway best-seller; thanks to him I’ve just spent three days in Afghanistan, Paris and Los Angeles. As the book opens, I am big brother to a baby sister whose Mom died in childbirth, living in a remote village in Afghanistan. Life is tough, but through the eyes of these children, life is idyllic, even though food is scarce and winters are cold. We have a huge oak tree with a swing, we play with the other children, and we have each other. Our father’s new wife is kind enough, but is busy with her own children, and the drudgery of cooking, cleaning and making do in a very small, poor Afghan village. Later, I am Pari, living in Paris with an alcoholic, self-absorbed mother, making a life for myself, but always with a nagging feeling of something just outside my peripheral vision, another life . . . The tale is told through the eyes of many, and on the way to the end of the tale we meet a wide spectrum of humanity, suffer the ills of war, callousness and unintended cruelties. We find that the man with superficial charm also saves and changes the lives of many, we find a doctor who finds fulfillment serving in the poorly resourced hospitals of Afghanistan, and we feel the agonies of a dutiful daughter watching her father fade into the world of Alzheimer’s. It’s a wonderful, wild ride, richly textured, and when it finishes, you are not ready for it to end. 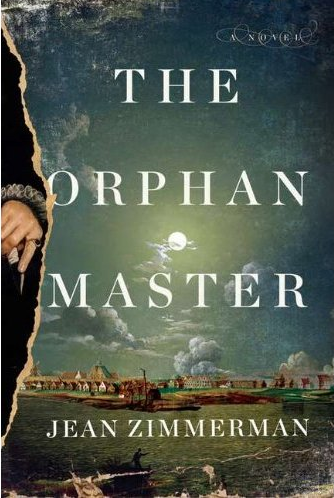 The Orphanmaster is another National Public Radio recommendation for people who like historical fiction, which I really do. I remember being a kid, and yawning my way through history, memorizing dates, it all seemed so irrelevant. Discovering historical fiction was like a light going on in a dark room for me – clever authors have found ways to illuminate events otherwise beyond my comprehension or worse – events I have a hard time making myself care about. Suddenly, the times are right now and relevant when the right author handles it, and it isn’t always easy to get it right. I have a few very favorite authors – Philippa Gregory, Zoe Oldenberg, Sharon Kay Penman, Jean Plaidy, Edward Rutherford – authors who do a lot of research before they ever sit down to write a novel, and from whom you can learn a lot. They get the nature of the dialogue right, they get the customs, traditions and mind-sets right, and they get it right when a person is born ahead of his or her time in terms of the challenges they face. I couldn’t put Orphanmaster down. It has to do with an era in American history which barely gets a paragraph in many history books, when the Dutch had a colony on what is now Manhattan Island, and trading posts up what is now the Hudson, into what is now New York. It was New Amsterdam, and many of the street names in modern day New York reflect their Dutch origins. The Orphanmaster‘s main character is not the Orphanmaster. He is a supporting character to the main character to a girl orphaned at 15, daughter of a Dutch man and wife who were not rich, but who did all right. They had a business, they traded, Blandine learned many things before they died, leaving her an orphan. She was determined to be what would now be an “emancipated minor,” but until she turned 16, she was semi-legally under the responsibility of the Orphanmaster, who sort of kept hands off and sort of watched out for Blandine. She lives on her own and is a successful trader, in her early twenties. She is also a very clean housekeeper, and has plans to grow her trading business, and has a serious suitor she intends to marry. Orphans start disappearing, and we discover a monster, a witiga, is on the loose. Blandine, and her new friend Drummond, are intrigued and disturbed by the disappearance of orphans, and the bloody, ritualistic mutilations of the orphans by the legendary Witiga. It’s well written. You want to keep reading and keep reading because you want to know how it ends and how they are able to solve the problem. It’s not one of the best books I’ve ever read for one reason – the author had the main characters talk as if they were modern people, using modern language, like ‘stuff.’ There was great openness between Blandine and her male friends. Blandine made all her own decisions, made her own arrangements and had full freedom, going where she wanted, doing what she wanted. The author explains it as part of the Dutch system, where some women had a lot of freedom, but I have a really hard time believing in a Dutch colony in the late 1600’s that any woman had the freedom Blandine had. There are parts of the novel where I am reading fast because I want to know what happens next and I get stopped up because Blandine says or does – or even THINKS – in a way that is very modern, and I just can’t buy it. We are who we are. There are many smart women. Most women through the centuries have had to learn to maneuver in whatever societal constrictions they have been allowed. I suspect there were a lot of societal restrictions in New Amsterdam, and Blandine’s freedom to take off with only her male servant, to run off and live with a man not her husband (even though they are both escaping death sentences), to live an unescorted life . . . I just have a hard time buying it. I know how restricted women are even to day. Four hundred years ago, women were more restricted, and worse, we bought into it. We didn’t have a lot of choices. 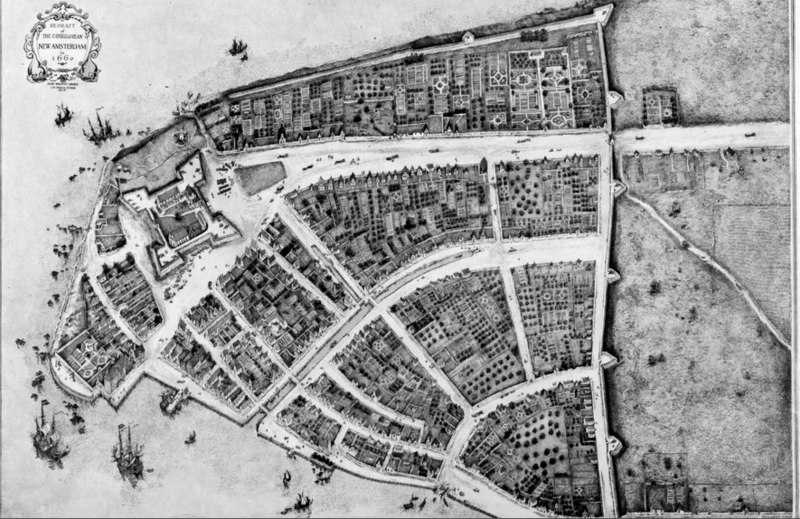 So I like this book, and I think there is a lot of information that is true of the settlement of New Amsterdam, I loved the geography and the physical descriptions, I loved the maps included, I loved the descriptions of food and living conditions. I do not buy the heroine, not for one minute. I do not believe, in that historical context, she would have been possible.